Only available in the UK though. MotoGP 14, the latest motocross simulation video game based on this season of the MotoGP championships, will get an exclusive pre-order bonus in the UK- if you pre-order at GAME, you will get the ‘Legends of MotoGP’ card game. Created by card game company Fournier, the ‘Legends of MotoGP’ deck pits the greatest riders in MotoGP history against each other. 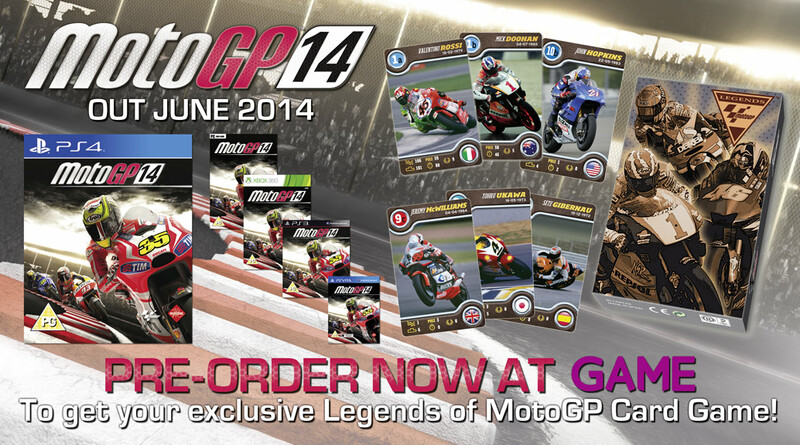 This pack is available to anyone who pre-orders MotoGP 14 from GAME in the UK before release. MotoGP 14 itself is going to be made available on the Xbox 360, PlayStation 3, PlayStation Vita, PlayStation 4, and Windows PCs. Developed by Milestone Interactive, the game represents the most advanced and authentic simulation of motocross sport ever. It will feature more than a hundred riders, all the official manufacturers, eighteen tracks, and online support for up to twelve players. It will also be the first motocross racing game that will be made available for next generation gaming devices. Stay tuned to GamingBolt for more coverage.